Today I want to look at write the Craftsman 10 Inch Contractor Table Saw Review (model number 21833). This is a very popular contractor saw from Craftsman and when you see what you are getting for your money its easy to see why. As with all table saws there are some features that people absolutely love, and some, not so much. so lets have a good look as to what this table saw has to offer. Item Weight (lbs. ): 288.0 lbs. As with most contractor table saw’s they tend to be too heavy to take from jobsite to jobsite. and the Craftsman 10 ” Contractor saw is no exception. it weighs in at impressive 265 lbs, so will definitely need 2 or more people to lift it and is one of the heavier contractor saws available. The weight of this saw may will appeal to a many woodworkers where portability is not an issue but the extra stability and accuracy that comes with heavy cast iron tables is high on the list. If space is limited in your workshop and need the ability to move the table saw. the Craftsman 10 Contractor Saw also comes with a very clever and effective rolling base that is incorporated into the saw stand. Its deployed by pressing a foot lever which drops and locks the the wheels allowing for the saw to be moved. 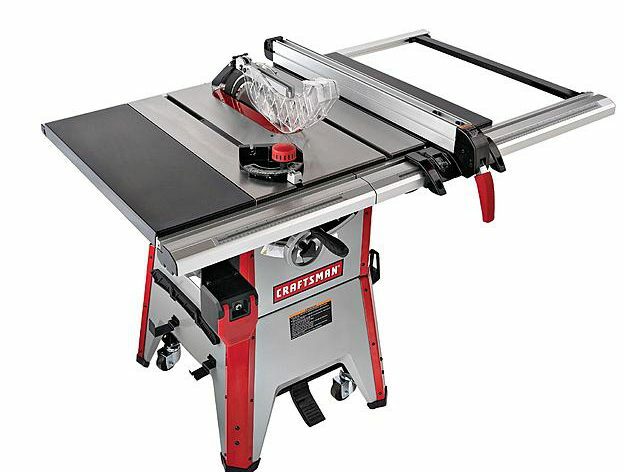 The Craftsman 21833 Contractor Table Saw comes with a 10″ 24 tooth ATB carbide tipped blade. Its good sharp and works well for ripping wood, but upgrading the blade will make a noticeable difference to the quality of cuts that you will get with this saw, particularly for crosscutting. The saw is will accept an 8″ dado blade up to 13/16″thick. The arbor is a standard 5/8″ so will accept all standard 10″ table saw blades. The Craftsman 21833 comes with a pretty standard blade guard system, which you will find on all new table saws now, that consists of an acrylic blade guard, riving knife and anti-kickback pawls. The blade guard can bit fitted and removed without the use of tools. The riving knife has three separate positions. So it can be used at full height with the blade guard and anti-kickback pawls for all through cuts and and at the lower settings where the blade guard is to be removed for non through cuts. The riving knife can also be removed or repositioned without the use of tools. The power button is on the left side of the front rail for easy access and features a large safety paddle switch to quickly switch the saw off if needed. The 21833 also comes with a plastic push stick that can be mounted onto the saw casing. The Craftsman 21833 also uses a standard 3/4″ x 3/8″ t-style miter track, This gives you the option of either using the very good cast iron miter gauge that comes with the saw or use any of the brilliant after market miter gauges on the market. The aluminium fence locks at both the back and front rails. It runs smoothly on the rail and locks securely and square to the blade. 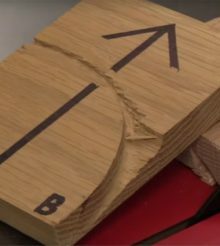 It doesn’t feature the micro adjust feature that can be found on other saws, but I don’t see this as an issue as most woodworkers like to measure from the blade anyway to ensure an accurate cut. So Craftsman have produced a brilliant saw for the money here and its clear to see why it is so popular. 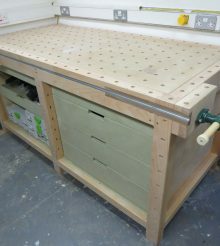 For the smaller home workshop, this table saw ticks a lot of boxes. Its heavy cast iron table combined with the smooth quiet induction motor greatly reduces vibration and makes for a more stable machine, which in turn improves the quality of the cuts from the saw. The fence glides easily and locks securely and squarely to the blade. If you are unlucky enough for this not to be the case, the fence can easily be adjusted by following the steps in the instructions. 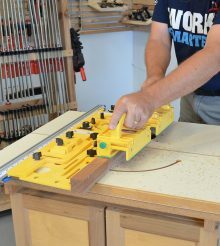 One of the best parts of this saw which will appeal a lot of woodworkers is the integrated mobile base. by pressing a foot lever the saw is raised onto its wheels enabling you to wheel the saw around your workshop or garage. One thing I would have like to see is a longer power lead. at 6 feet long, I don’t feel it is long enough. However it is something that you can replace if you need the extra length. Its worth noting that this isn’t a unique issue with the Craftsman saw, it’s quite common to see 6 foot power leads. At the time of writing this saw is available at Sears for $599 which represents amazing value for a saw of this quality and features. Didn’t think much about the video review. I found one on CL for $250, but I’ll stick with my ancient model 113.xxxxxxx..